serving Southern Oregon and Northern California. Digital Radiography revolutionizes our ability to clearly image the joints and bones of the horse. The digital images generated by this system of digital radiography offer much more sharpness and resolution than traditional radiographs. The images are easily sent over the internet to facilitate timely consultations with surgeons and radiologists. We continually update and invest in our diagnostic imaging equipment so that we can provide the equine communities of Southern Oregon and Northern California with the best imaging available. Left, a lateral to medial view of a right hock that shows degenerative changes in the lowest (tarsometatarsal) joint. The small triangular dark area on the right lower edge of the lowest bone in the hock represents damage to that part of the bone. This is the most common lesion that we see in working horses of all types and shows the stress that is placed on this joint when horses are asked to start, stop and turn quickly and work in collection. Middle, a lateral to medial digital radiograph of the right carpus (knee). It shows several small fragments of bone in both the radiocarpal and intercarpal joints. This is a common injury in thoroughbred and quarter horse race horses that work at high speeds.Right, a dorsal to palmar (front to back) view of the right carpus. This is the same horse shown the middle image. This shows why we need to take more than one view (frequently several) to see lesions. On this view the carpus appears to be normal. Left, a normal forefoot and right, a foundered foot, showing the serious effects of founder and why it is so crippling to horses. As with digital radiography, we were also the first to provide our region with digital ultrasound for imaging the soft tissues of horses. This greatly advanced our ability to diagnose and properly treat performance problems such as suspensory ligament and flexor tendon injuries, and to examine the deeper structures of the equine chest and abdomen in colic and respiratory conditions. Left: This is a digital ultrasound image of the flexor tendons of the forelimb. There is a dark, ‘core lesion’ in the superficial digital flexor tendon which is the uppermost, half-moon shaped structure on the image on the left. The left image is a transverse image of the tendons, the image on the right is a longitudinal image. This injury is common in race horses, but occurs in all breeds when the horse hyperextends the fetlock, and frequently occurs when horses are fatigued. Right: This is a normal ultrasound image of the flexor tendons of the hind limb. Recently we added digital videoendoscopy capable of imaging everything from the upper and lower airway to the inside of the stomach. This allows us to directly visualize gastric ulcers in the stomachs of horses, an insidious performance limiting problem that was previously diagnosed only by clinical signs which are often subtle and easily missed. 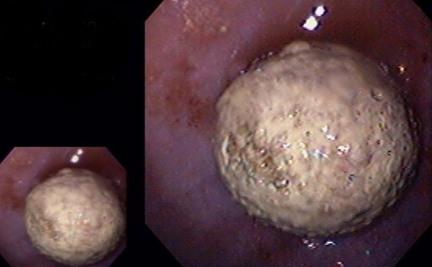 This is a digital endoscopic view of a bladderstone in the bladder of a male miniature donkey. It was acquired using a three meter endoscope passed up the urethra. It measured about 5 centimeters in diameter. © 2018 Rogue Equine Hospital. All rights reserved.